There is a city overrun by every type of wild dog, where mysterious machines pump out meat daily for their hungry mouths, where a pack of painted dogs protect everyone from monsters called hulkers. Everyone has always had enough food. 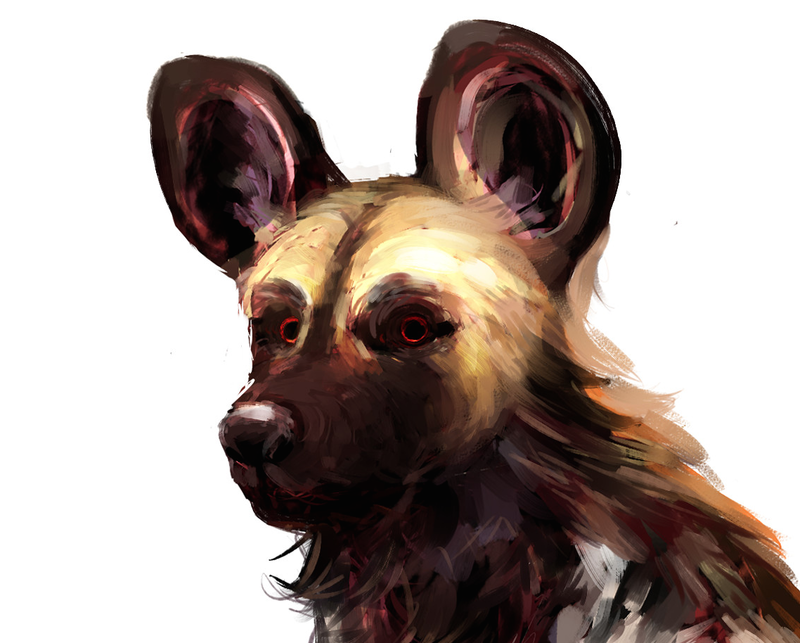 That is what Mhumhi, a young painted dog, has grown up believing. But Mhumhi is not a member of the pack- as a infant, he was stolen by a domestic dog and adopted into an unlikely litter of all different species. He has grown up half in hiding with his adoptive siblings- a bush dog, a dhole, and an ethiopian wolf. Mhumhi only sets out to protect the two small hulkers, but in doing so he begins to uncover not just his mother’s secrets, but the dark backbone of the entire city. Darkeye was originally a NaNoWriMo project, but the story wasn’t finished by November 30. It was completed on August 23, 2014. SPECIAL NOTE: Ebook and print versions of Darkeye (split across 3 volumes) will be available to buy starting October 1st. After careful consideration, I have decided to leave the original first draft of Darkeye up here at the site so that those who can’t afford the books can still enjoy it. However, since this is a draft, it is much less polished than the published books are. If you enjoy reading Darkeye here and want to support my writing, please consider buying the published versions! To start reading the original draft, head over to the archive! Please note that the story contains scenes of severe violence, including violence towards and by animals, and references to suicide. If you’re interested in learning more information about the real-life canids that inspired Darkeye, I’m starting a series on canid behavior and ecology over in the nonfiction section of the site.